New York Zipsters Get a Charge out of Driving with New Accord Plug-in Hybrids! Edison ParkFast and Zipcar, Inc., the world’s leading car sharing network, today announced the introduction of twenty 2014 Honda Accord Plug-in Hybrids to the Zipcar New York fleet at Edison ParkFast locations throughout the city. The new Honda Accord Plug-ins are located at 10 convenient locations throughout Manhattan, with Zipcar branded parking spots and charging stations at each site. The plug-ins are available to all Zipcar members ages 21+, starting from $14.50 per hour. Zipcar is a longstanding pioneer in using advanced vehicle technologies as the first car sharing company in the United States to introduce electric vehicles, starting in Boston in 2002, and the first to offer hybrid vehicles through a partnership with Honda in Seattle in 2003. Zipcar’s strong innovative history joined with Edison ParkFast’s numerous locations provides Zipcar members with access to new advanced technology and more alternate fuel vehicles, both ranked highly by members in recent surveys. Honda’s 2014 Accord Plug-in Hybrid, based on the popular five-passenger Accord, is rated at a combined fuel economy of 46 mpg. On a full charge and tank of gas the range of the Accord Plug-in Hybrid is approximately 570 miles. The Honda Accord Plug-In Hybrid battery can be recharged in about three hours when plugged into a standard 120-volt electrical outlet, and in less than one hour using a 240-volt “Level-2” charger. For more information, visit www.zipcar.com. 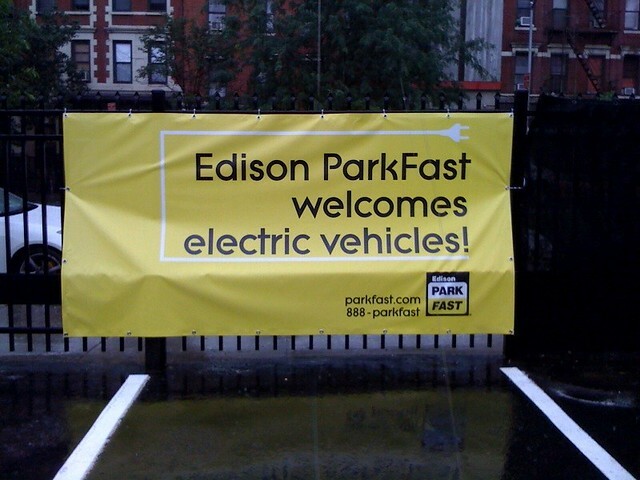 Edison ParkFast is a leading parking company with an emphasis on customer service that owns and operates 40 garages and lots in New York City, Northeastern New Jersey and Baltimore. ParkFast offers daily and monthly parking packages, text-ahead service, motorcycle, bike and scooter storage and electronic charging stations at many locations. ParkFast is part of Edison Properties, a family-owned company that also owns and operates Manhattan Mini Storage, WorkSpace Offices, Executive Offices and Pre-Built Suites, the Hippodrome office building and the Ludlow, the luxury residential high-rise on the Lower East Side. In addition to producing the Accord Plug-In, Honda has developed numerous technologies to improve fuel efficiency and reduce CO2 emissions, including the Honda Fit EV, Civic Natural Gas and the Honda FCX Clarity fuel cell electric vehicle (FCEV). Honda has also led the Union of Concerned Scientists (UCS) rankings of overall vehicle environmental performance since 2000, and a Honda vehicle has topped the list of America’s greenest vehicles from the America Council for an Energy-Efficient Economy (ACEEE) for 15 out of 16 years.